In physics, temperature is a physical property of a system that underlies the common notions of hot and cold; something that feels hotter generally has the higher temperature. Temperature is one of the principal parameters of thermodynamics. If no heat flow occurs between two objects, the objects have the same temperature; otherwise heat flows from the hotter object to the colder object. This is the content of the zeroth law of thermodynamics. On the microscopic scale, temperature can be defined as the average energy in each degree of freedom in the particles in a system. Because temperature is a statistical property, a system must contain a few particles for the question as to its temperature to make any sense. For a solid, this energy is found in the vibrations of its atoms about their equilibrium positions. In an ideal monatomic gas, energy is found in the translational motions of the particles; with molecular gases, vibrational and rotational motions also provide thermodynamic degrees of freedom. Temperature is measured with thermometers that may be calibrated to a variety of temperature scales. In most of the world (except for Belize, Myanmar, Liberia and the United States), the Celsius scale is used for most temperature measuring purposes. The entire scientific world (these countries included) measures temperature using the Celsius scale and thermodynamic temperature using the Kelvin scale, which is just the Celsius scale shifted downwards so that 0 K= −273.15 °C, or absolute zero. Many engineering fields in the U.S., notably high-tech and US federal specifications (civil and military), also use the kelvin and degrees Celsius scales. Other engineering fields in the U.S. also rely upon the Rankine scale (a shifted Fahrenheit scale) when working in thermodynamic-related disciplines such as combustion. Intuitively, temperature is the measurement of how hot or cold something is, although the most immediate way in which we can measure this, by feeling it, is unreliable, resulting in the phenomenon of felt air temperature, which can differ at varying degrees from actual temperature. On the molecular level, temperature is the result of the motion of particles which make up a substance. Temperature increases as the energy of this motion increases. The motion may be the translational motion of the particle, or the internal energy of the particle due to molecular vibration or the excitation of an electron energy level. Although very specialized laboratory equipment is required to directly detect the translational thermal motions, thermal collisions by atoms or molecules with small particles suspended in a fluid produces Brownian motion that can be seen with an ordinary microscope. The thermal motions of atoms are very fast and temperatures close to absolute zero are required to directly observe them. For instance, when scientists at the NIST achieved a record-setting low temperature of 700 nK (1 nK = 10 K) in 1994, they used optical lattice laser equipment to adiabatically cool caesium atoms. They then turned off the entrapment lasers and directly measured atom velocities of 7 mm per second in order to calculate their temperature. Temperature plays an important role in almost all fields of science, including physics, geology, chemistry, and biology. 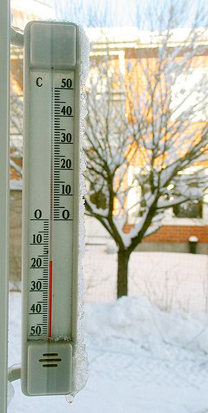 Temperature measurement using modern scientific thermometers and temperature scales goes back at least as far as the early 18th century, when Gabriel Fahrenheit adapted a thermometer (switching to mercury) and a scale both developed by Ole Christensen Rømer. Fahrenheit's scale is still in use in the USA, with the Celsius scale in use in the rest of the world and the kelvin scale. The basic unit of temperature (symbol: T) in the International System of Units (SI) is the kelvin (Symbol: K). The kelvin and Celsius scales are, by international agreement, defined by two points: absolute zero, and the triple point of Vienna Standard Mean Ocean Water (water specially prepared with a specified blend of hydrogen and oxygen isotopes). Absolute zero is defined as being precisely 0 K and −273.15 °C. Absolute zero is where all kinetic motion in the particles comprising matter ceases and they are at complete rest in the “classic” (non-quantum mechanical) sense. At absolute zero, matter contains no thermal energy. Also, the triple point of water is defined as being precisely 273.16 K and 0.01 °C. This definition does three things: 1) it fixes the magnitude of the kelvin unit as being precisely 1 part in 273.16 parts the difference between absolute zero and the triple point of water; 2) it establishes that one kelvin has precisely the same magnitude as a one degree increment on the Celsius scale; and 3) it establishes the difference between the two scales’ null points as being precisely 273.15 kelvins (0 K = −273.15 °C and 273.16 K = 0.01 °C). Formulas for converting from these defining units of temperature to other scales can be found at Temperature conversion formulas. In the field of plasma physics, because of the high temperatures encountered and the electromagnetic nature of the phenomena involved, it is customary to express temperature in electronvolts (eV) or kiloelectronvolts (keV), where 1 eV = 11,604 K. In the study of QCD matter one routinely meets temperatures of the order of a few hundred MeV, equivalent to about 10 K.
In the macroscopic sense relevant to most people, a negative temperature is one below the zero-point of the measurement system used. For example, a temperature of 100 K is equivalent to −173.15 °C. Temperatures of macroscopic systems may have negative values in the Celsius and Fahrenheit, but not in the Kelvin or Rankine scales. However, for some systems and specific definitions of temperature, it is possible to obtain a negative temperature, which is numerically less than absolute zero. However, a system with a negative temperature is not colder than absolute zero, but rather it is, in a sense, hotter than infinite temperature. If two systems with fixed volumes are brought together in thermal contact, changes will most likely take place in the properties of both systems. These changes are caused by the transfer of heat between the systems. A state must be reached in which no further changes occur, to put the objects into thermal equilibrium. A basis for the definition of temperature can therefore be obtained from the Zeroth Law of Thermodynamics which states that if two systems, A and B, are in thermal equilibrium and a third system C is in thermal equilibrium with system A then systems B and C will also be in thermal equilibrium (being in thermal equilibrium is a transitive relation; moreover, it is an equivalence relation). This is an empirical fact, based on observation rather than theory. Since A, B, and C are all in thermal equilibrium, it is reasonable to say each of these systems shares a common value of some property. This property is called temperature. The pressure, volume, and the number of moles of a substance are all inherently greater than or equal to zero, suggesting that temperature must also be greater than or equal to zero. As a practical matter it is not possible to use a gas thermometer to measure absolute zero temperature since the gasses tend to condense into a liquid long before the temperature reaches zero. It is possible to extrapolate how many degrees below the present temperature the absolute zero is from the temperature range where Equation 1 works. , where k = R / n (n= Avogadro number, R= ideal gas constant). More realistically, no such ideal vacuum exists. For instance a thermometer in a vacuum chamber which is maintained at some finite temperature (say, chamber is in the lab at room temperature) will equilibrate with the thermal radiation it receives from the chamber and with time reaches the temperature of the chamber. If a thermometer orbiting the Earth is exposed to a sunlight, then it equilibrates at the temperature at which power received by the thermometer from the Sun is exactly equal to the power radiated away by thermal radiation of the thermometer. For a black body this equilibrium temperature is about 281 K (+8 °C). Since Earth has an albedo of 30%, average temperature as seen from space is lower than for a black body, 254 K, while the surface temperature is considerably higher due to the greenhouse effect. A thermometer far away from the Solar system still receives Cosmic microwave background radiation. Equilibrium temperature of such thermometer is about 2.725 K, which is the temperature of a photon gas constituting black body microwave background radiation at present state of expansion of Universe. This temperature is sometimes referred to as the temperature of space. This temperature is thus like a test charge in that it facilitates a measure of the system even though temperature is not strictly defined there. In the previous section temperature was defined in terms of the Zeroth Law of thermodynamics. It is also possible to define temperature in terms of the the second law of thermodynamics, which deals with entropy. Entropy is a measure of the disorder in a system. The second law states that any process will result in either no change or a net increase in the entropy of the universe. This can be understood in terms of probability. Consider a series of coin tosses. A perfectly ordered system would be one in which either every toss comes up heads or every toss comes up tails. This means that for a perfectly ordered set of coin tosses, there is only one set of toss outcomes possible: the set in which 100% of tosses came up the same. On the other hand, there are multiple combinations that can result in disordered or mixed systems, where some fraction are heads and the rest tails. A disordered system can be 90% heads and 10% tails, or it could be 98% heads and 2% tails, et cetera. As the number of coin tosses increases, the number of possible combinations corresponding to imperfectly ordered systems increases. For a very large number of coin tosses, the combinations to ~50% heads and ~50% tails dominates and obtaining an outcome significantly different from 50/50 becomes extremely unlikely. Thus the system naturally progresses to a state of maximum disorder or entropy. The below table demonstrates that the properties of air change significantly with temperature.